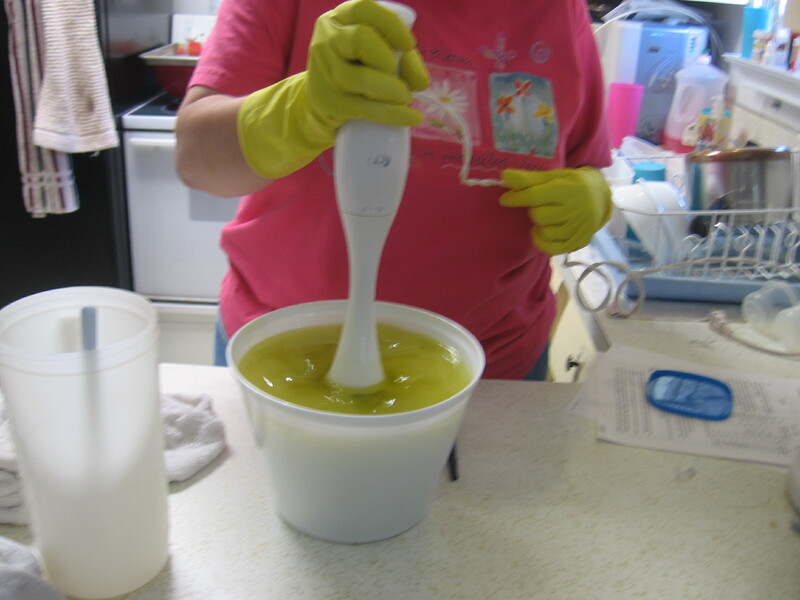 It’s time for another soap recipe! This is one I formulated specifically to promote smooth complexions for teenagers and adults. My family all uses it and likes it so much that they voluntarily check on our inventory and alert me if we ever get low. It has a creamy smooth, soothing lather, a refreshing cool scent, and clears up oily skin and acne without over-drying. I literally don’t use any other products on my face. Besides the base oils of Olive and Coconut that I use in all kinds of soap, Grapeseed oil has astringent properties, Jojoba is very closely related to the protective oils in our skin, Tea Tree Oil (Melaleuca) is a natural antibiotic and antiseptic, and peppermint is refreshing and tightens the pores. Every ingredient is natural and has a specific purpose. I will refer you to my prior post about soap making for more specifics about how to get started. If you’re familiar with that process, with a few simple changes in the ingredients you’ll soon be making Cool Complexion Soap. I always make this in Pringles cans so we can distinguish it from my hand and body soaps. Face soap is round, like your face. 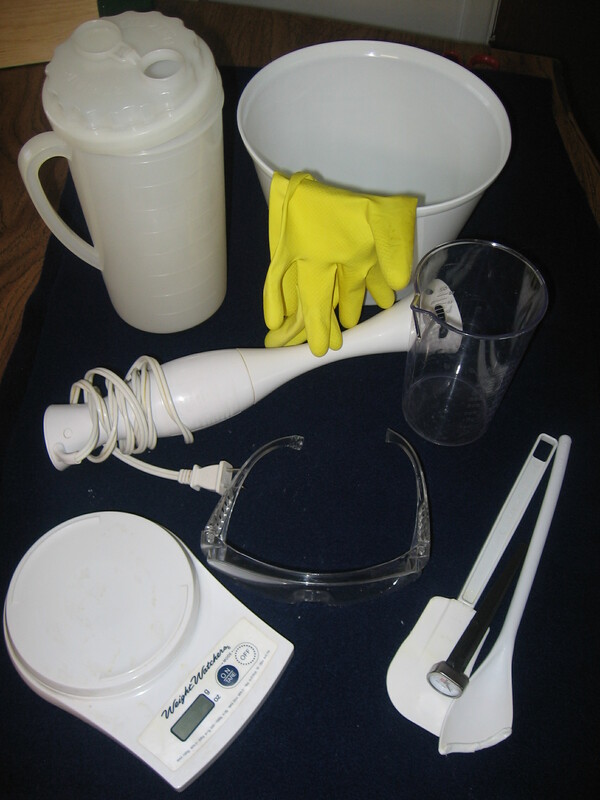 Here’s a refresher about tools and utensils you’ll need: A large (plastic) bowl for oils, pitcher for mixing lye, long handled plastic or wooden spoon, rubber spatula or scraper, stick blender, meat or candy thermometer digital scale that measures in ounces. Prepare your mold first. In this case, that means rinse and dry three regular sized Pringles potato crisps cans. Keep CHILDREN and PETS AWAY while you work! Wear PROTECTIVE GOGGLES and RUBBER GLOVES while handling lye, and long sleeves. 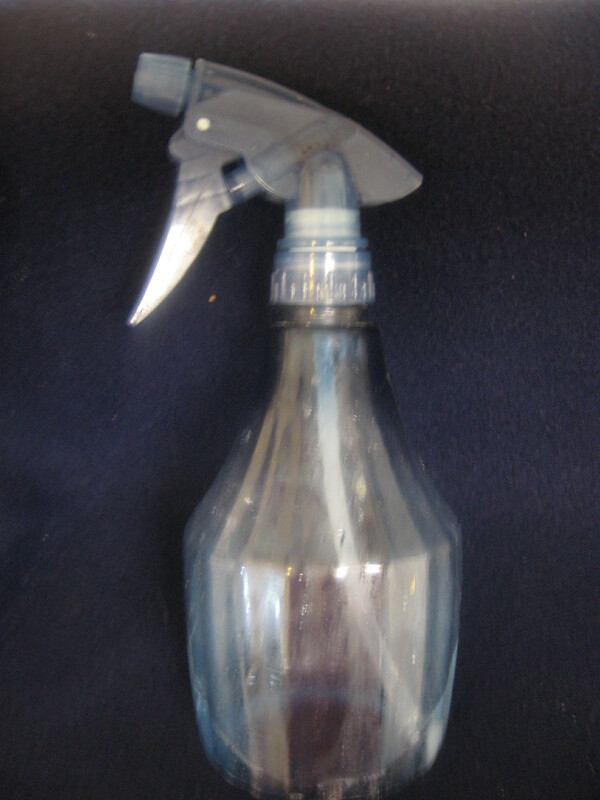 Keep a spray bottle of VINEGAR handy to neutralize any spills or accidental contact with skin. Opening a window is a good idea. Use a reliable THERMOMETER, and an accurate DIGITAL SCALE It is imperative that you MEASURE PRECISELY! REMEMBER to RESET the SCALE with each measurement to SUBTRACT the WEIGHT of the CONTAINER! NEVER use your containers or utensils for other things, particularly food items. ALWAYS measure, mix, and melt oils together FIRST. ALWAYS add your lye to the water, NEVER add water to lye!!!! For clean-up: Using rubber gloves, spray all your utensils with vinegar, rinse, then wash with dish soap and dry. So. . . Here’s the recipe! PUT YOUR GOGGLES AND GLOVES ON NOW. Keep checking until your oils and lye mixture both reach the same temperature of approximately 100°F. (Warmer temperatures will produce a darker finished product.) 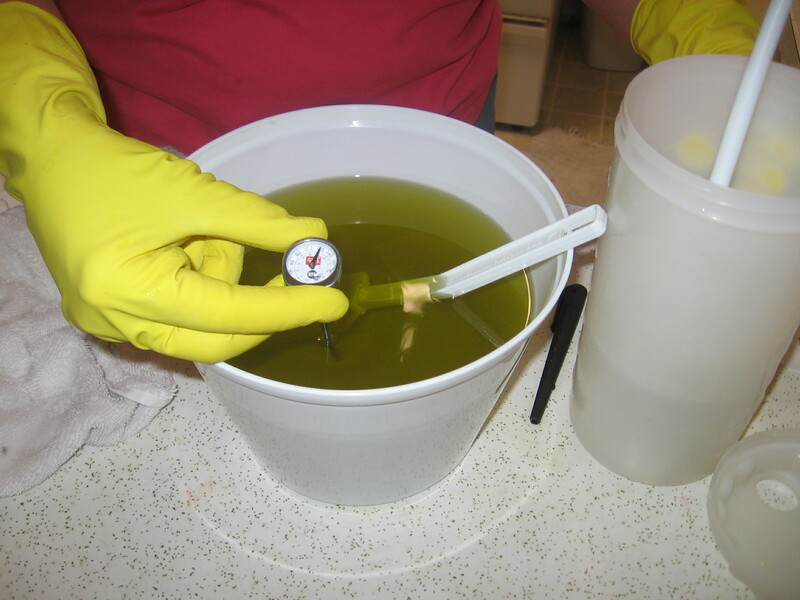 Pour the LYE MIXTURE INTO THE OIL, stir gently, then mix with your stick blender in short bursts until trace. You’ll know it’s trace when it looks like a soft pudding. (Drops can be seen on the surface.) In my experience, this can take anywhere from 5 minutes to 25 or 30, depending on temperature, types of oil, and who-knows-what other factors. Just enjoy the colorful changes that take place, and don’t worry, they’re just part of the chemical reaction you get with the tea. This batch was not made with tea, so it’s a lighter color than you can expect from my updated version of Complexion Soap with peppermint tea. Mix them in well, then you’re ready to pour your soap into molds. 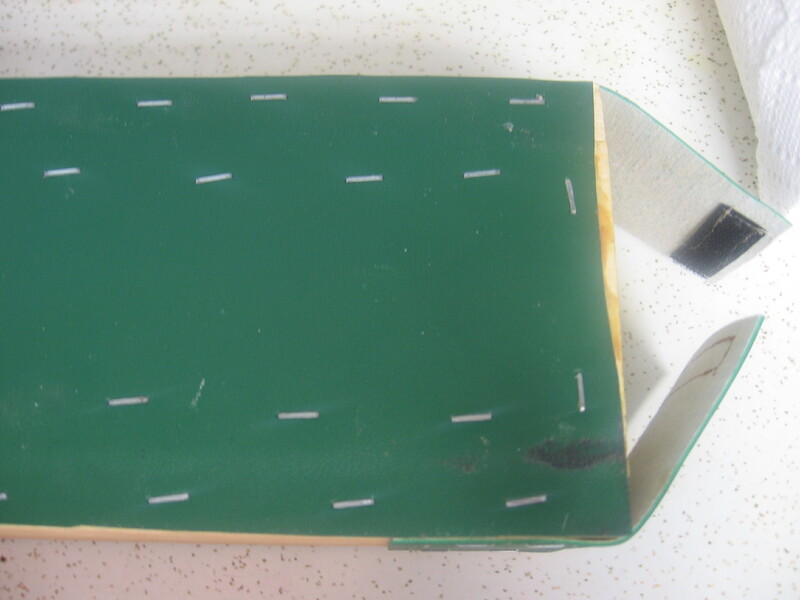 Cover the molds with the original lids. Soap heats up as a part of the chemical process, but it also needs to maintain even heat, and cool down slowly to come out right. Huddle your Pringles cans together as much as possible, and wrap them with a kitchen towel or two to insulate for about 24 hours. 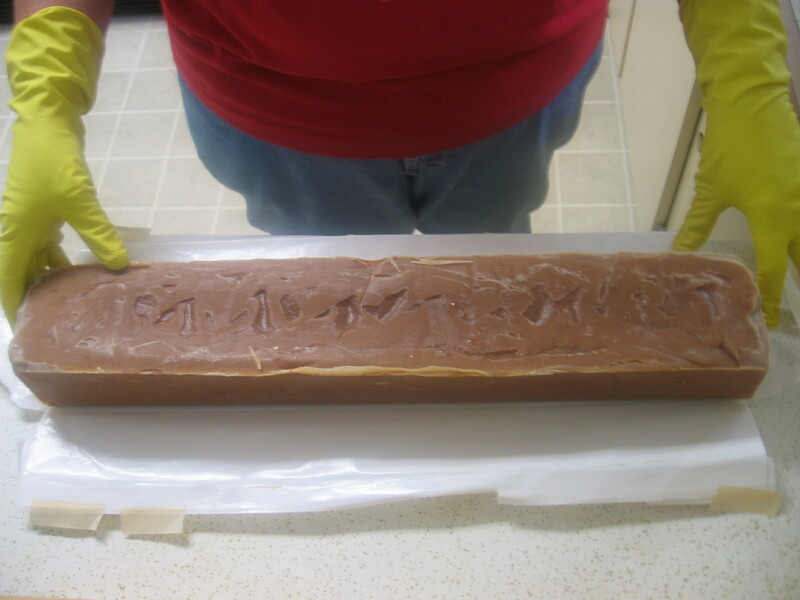 Next day: Use rubber gloves while you snip into the cans and tear the molds from the soap. It will be about the consistency of a block of cheddar cheese, and can be cut into bars. 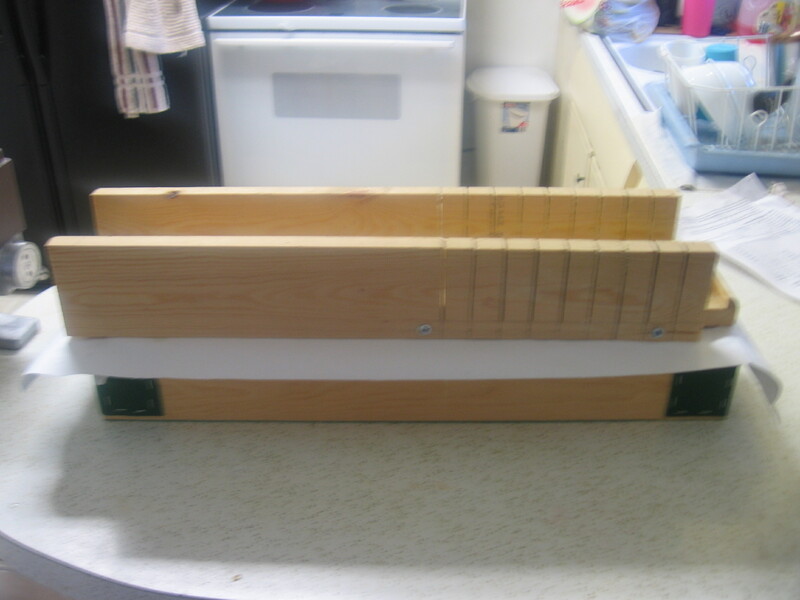 Place the bars on a rack or tray in an out-of-the-way place where they can get good air circulation. Try to be patient! I know, you can hardly wait to try it! 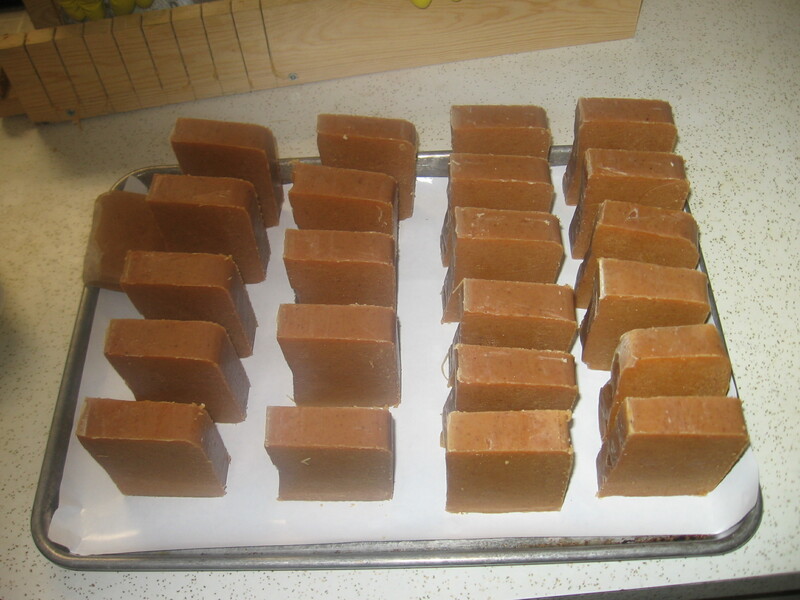 Your new soap will have finished curing and be safe for your skin in two to three weeks. Happy Soap Making and a Smooth Cool Complexion to you! 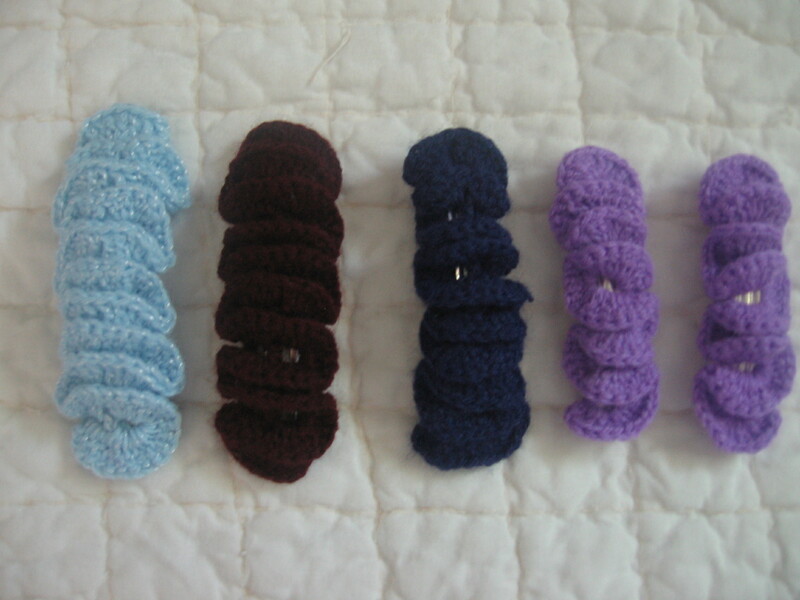 Years ago, I had a favorite type of hair clip (barrette.) It held tight, didn’t pull or rip my hair, and adjusted to accommodate any portion of my hair I wanted to clip back. I bought them individually and payed at least several dollars each, but they were so worth it. More recently I have found the same type of clip in bulk packaging in craft stores. 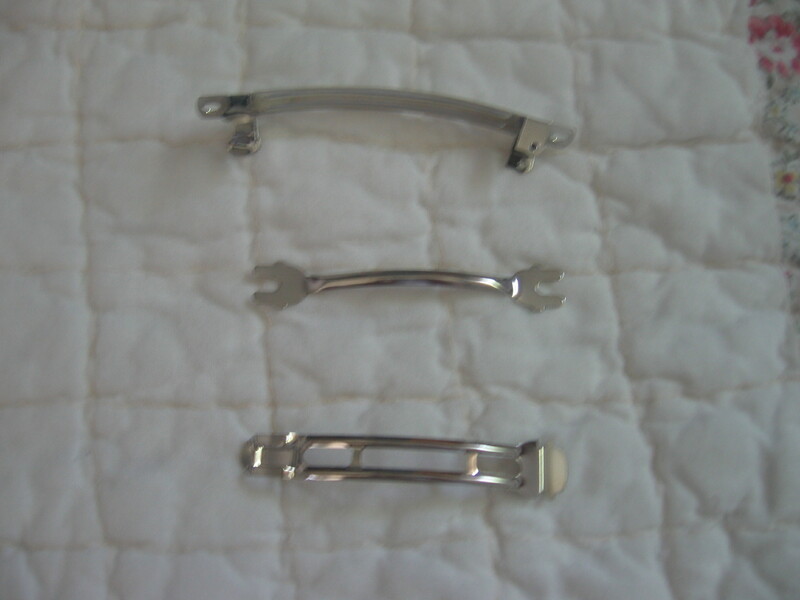 Three pieces assemble easily in just a few seconds when your design is fastened. They’re “unfinished” and come in three sizes. They actually disassemble very easily so you can design them however you desire but they don’t break or come apart when they’re not supposed to. With your choice of wire, a needle and thread, or hot glue you are in business. Beads, buttons, needlework, yarn, sequins, fabric, ribbons, and feathers. . . the sky is the limit on what you can do with them. Here are a few designs I’ve made with them. 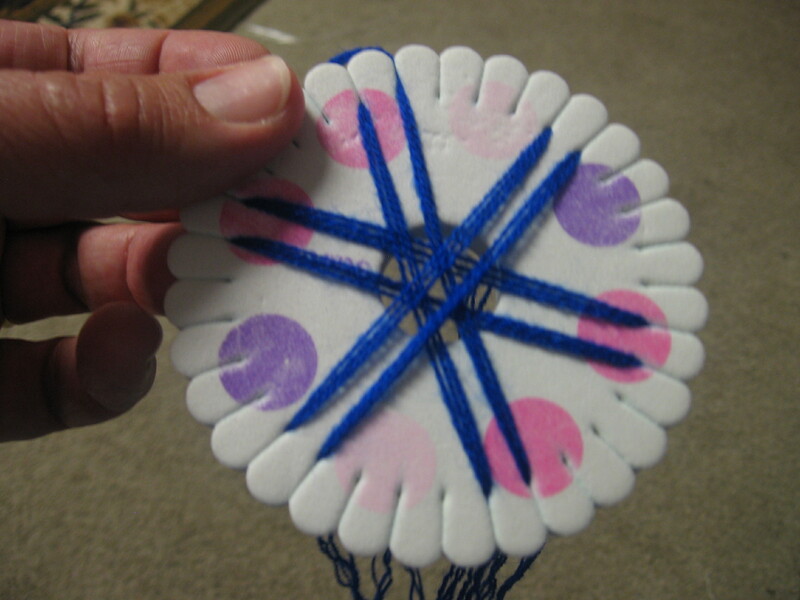 To see a tutorial on how to use the wheel, check HERE. 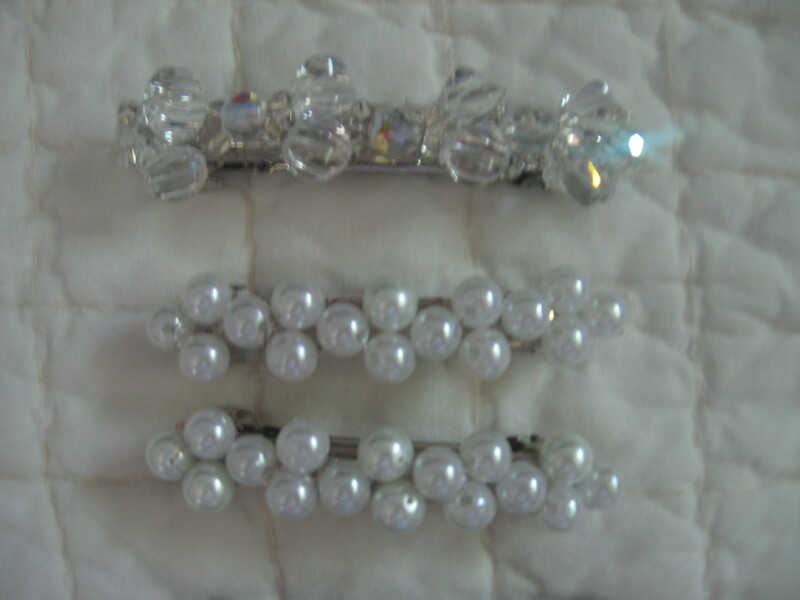 Buttons and pearl beads are secured with fine wire on this barrette. When I use wire I always twist the ends and dab with a little hot glue to cover the sharp ends. 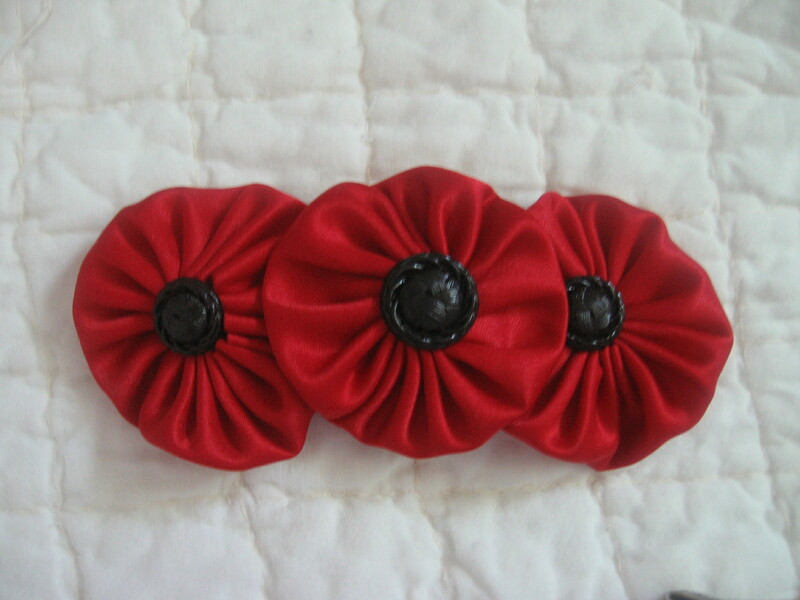 These were made with a beading loom. 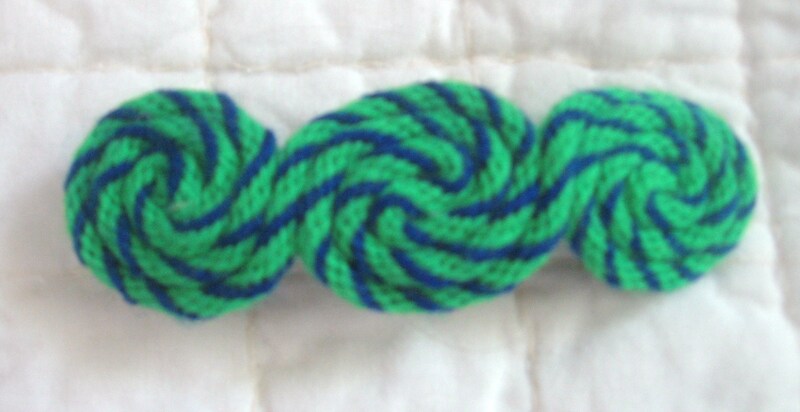 With the threads still attached, I wove them around the clip and through each row of beads to secure them tightly to the barrette. 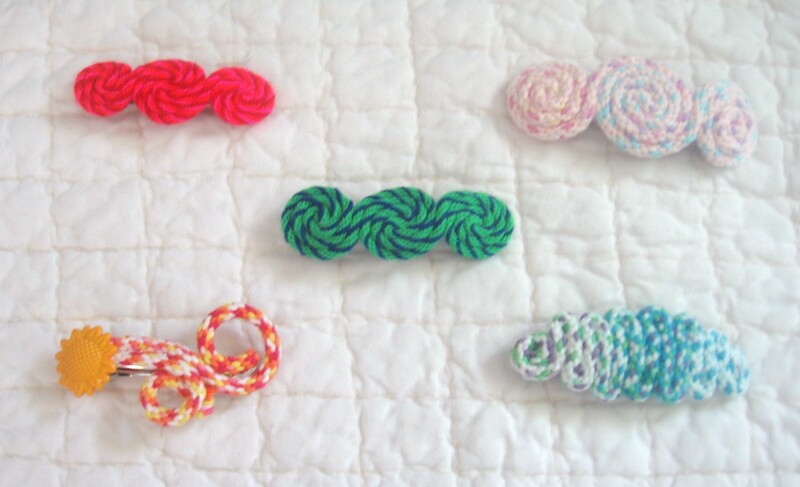 I made these fabric “yo-yos,” tacked them together on the back, secured buttons in their centers, and sewed them to the barrette. 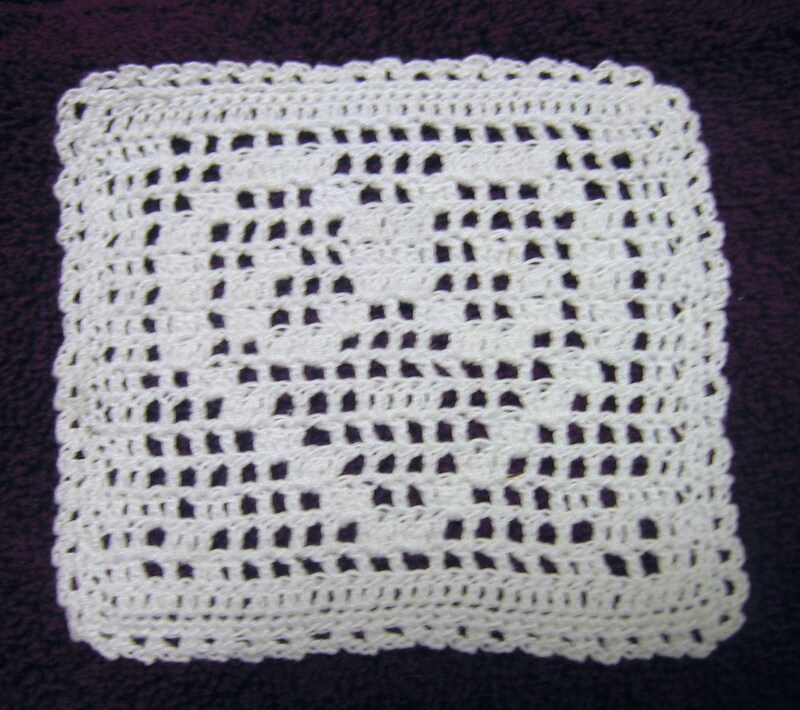 These are made with shiny crochet cotton using a size D crochet hook with the afghan stitch (tunisian crochet.) 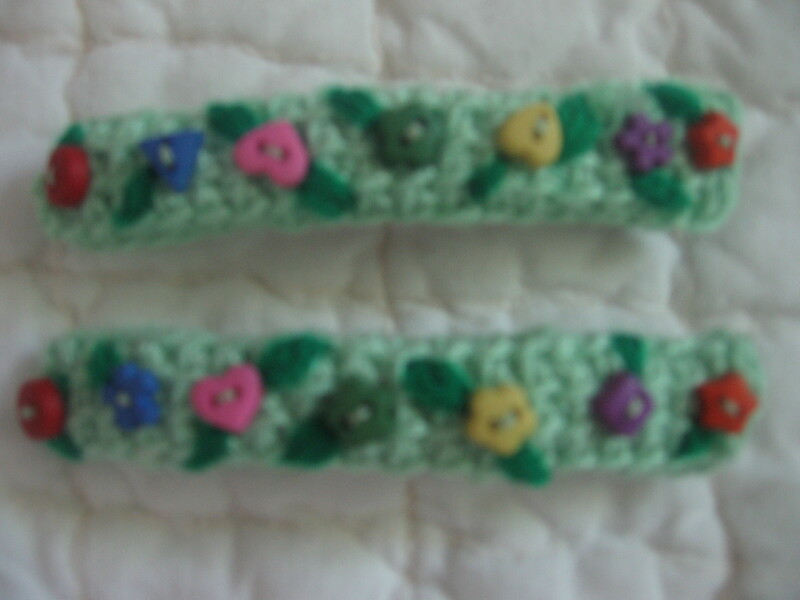 Tiny buttons and green needlepoint leaves finished them off. 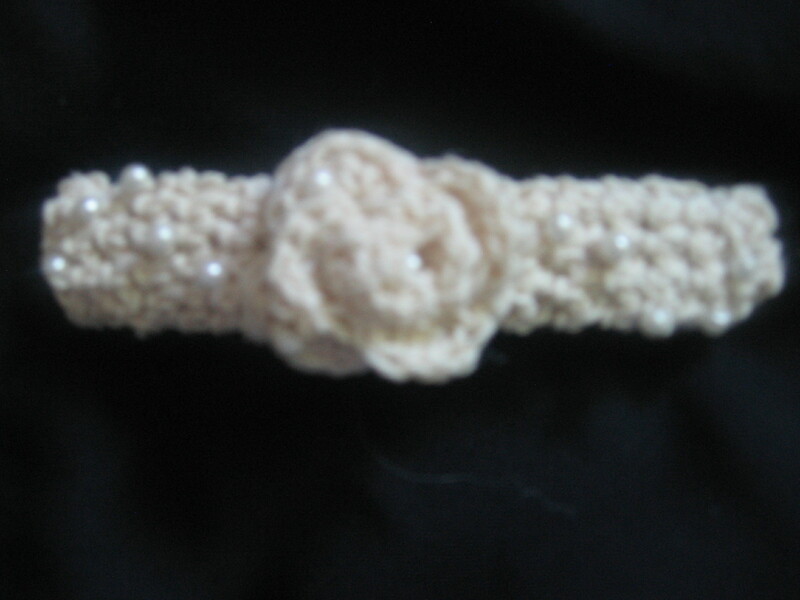 This is also crocheted using #10 crochet cotton and a size D hook in the single crochet thermal stitch, a crocheted flower, and randomly placed pearl beads. 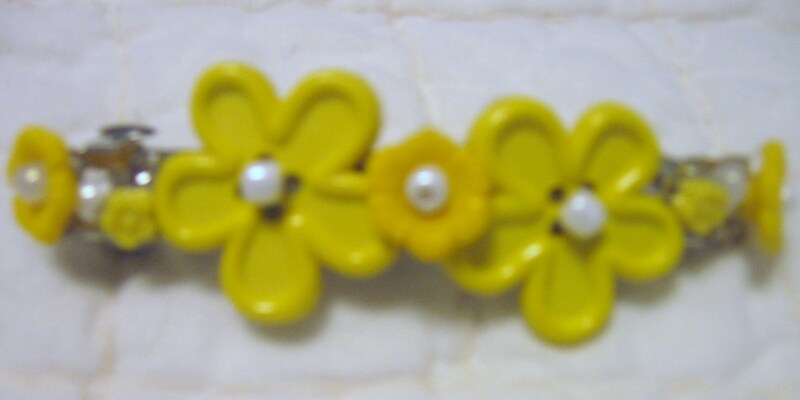 I used very thin wire to thread these beads and attach them to the clips as I went along. These were some of the first experiments I made, and I’m thinking of re-doing them, especially since I took a look at THIS beading pattern. 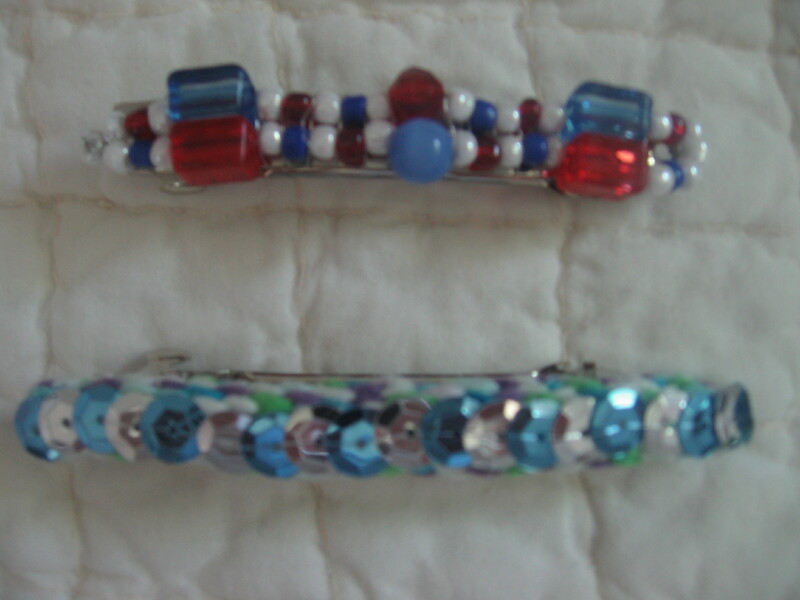 The beads were worked with fine wire, wrapping it around the barrette to secure it as I went along. 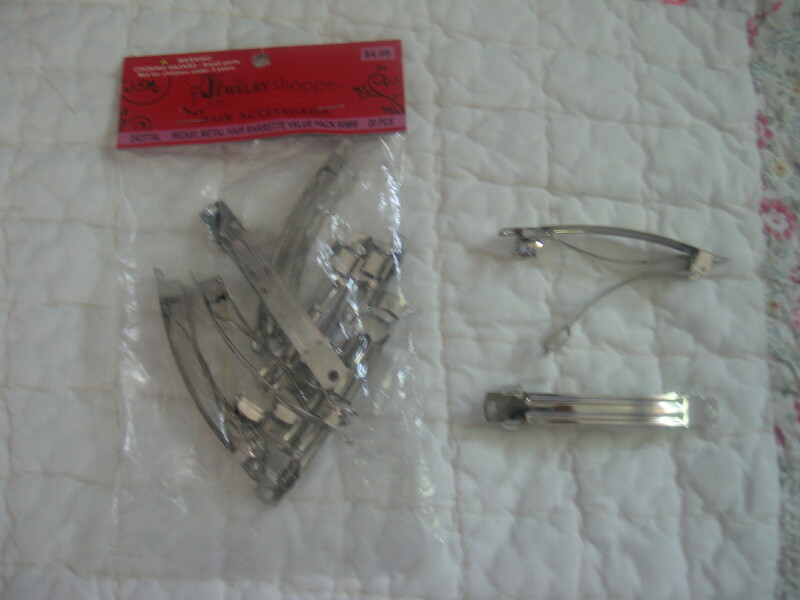 The sequins were attached with a needle and transparent plastic thread to cording that had previously been attached by needle and thread to the barrette. 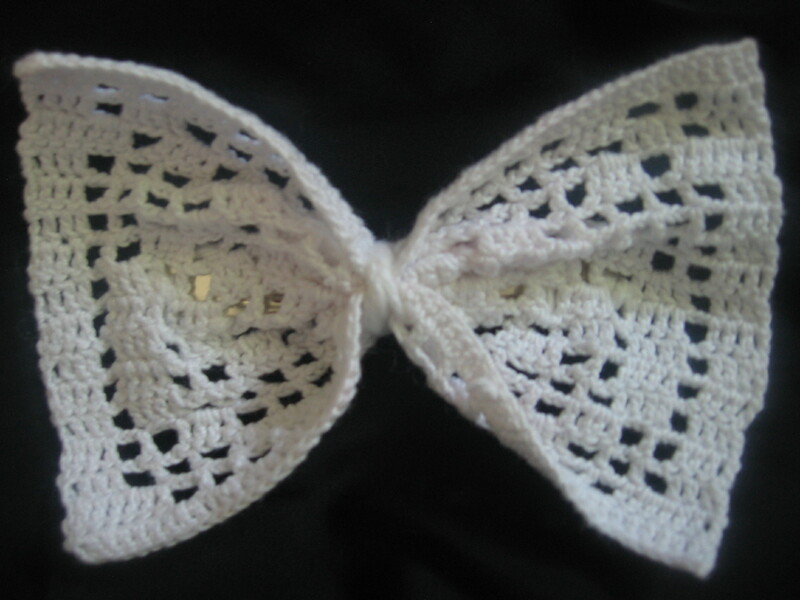 This is a filet crochet style doily I made and cinched up in the center, tacking it to the barrette with a needle and matching white crochet cotton. One of my driving forces is self sufficiency. Knowing that you’re capable of fulfilling some of your own basic needs without having to depend upon another human being is very satisfying. The characteristic of independence is developed early in children. We could never stretch to reach the heights or feel the satisfaction of great accomplishment without this innate desire. I’m also a cautious person. I’m not a risk taker if I can help it. I take my time studying things out before trying something new. I researched for over a year before I dared plunge into soap making. I’ve been at it now since 2009. Of course, now I’m hooked! I LOVE my soap! Not only because I developed my own recipes and know exactly what’s in it, but because having dry, itchy skin is history and I don’t have to buy complexion products for myself or my teenagers. 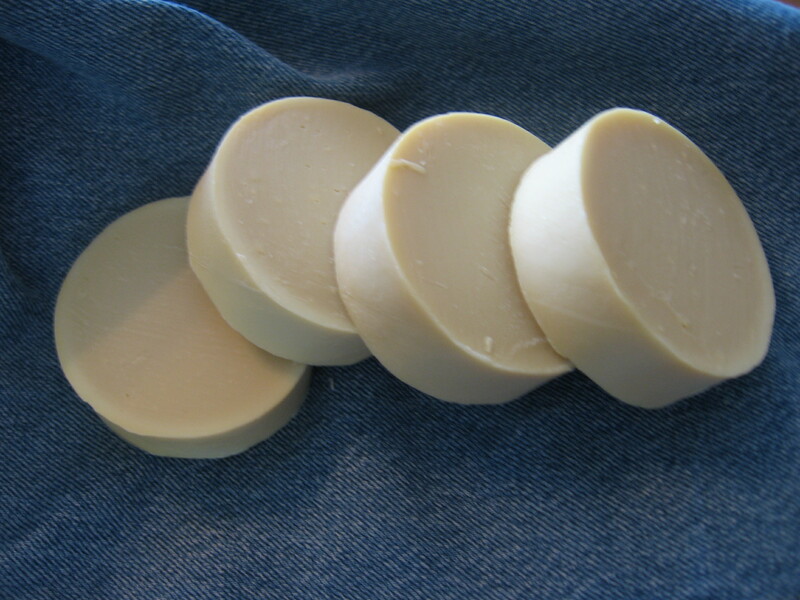 (Complexion soap recipe to come later.) It has been a very satisfying venture. In the beginning I felt like I had to guard my recipes and didn’t want to share, but I’ve had a change of heart. 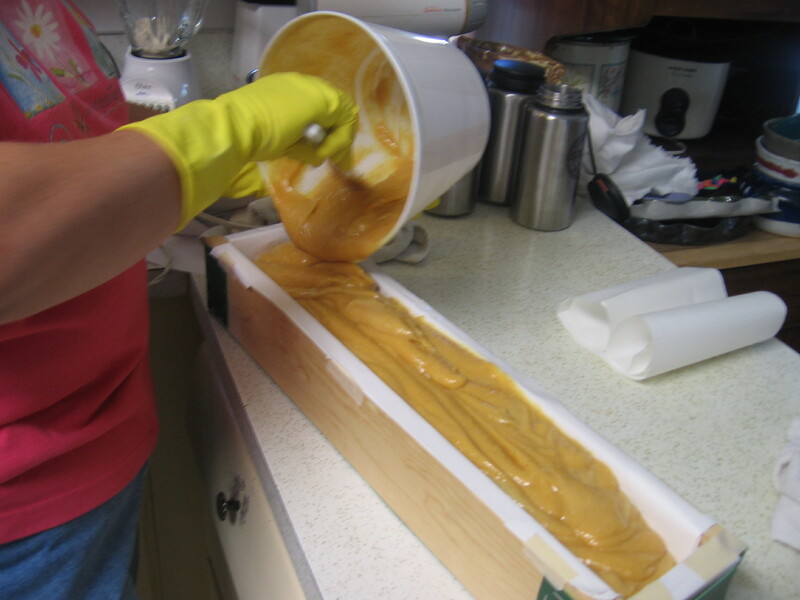 Soap making is a skill that’s out there for anyone to figure out, but I hope the practical applications of my research will make it easier for someone else to take the plunge. Part of what I learned was a little difficult to find in free online sources. For instance, figuring the batch size/mold volume ratios. 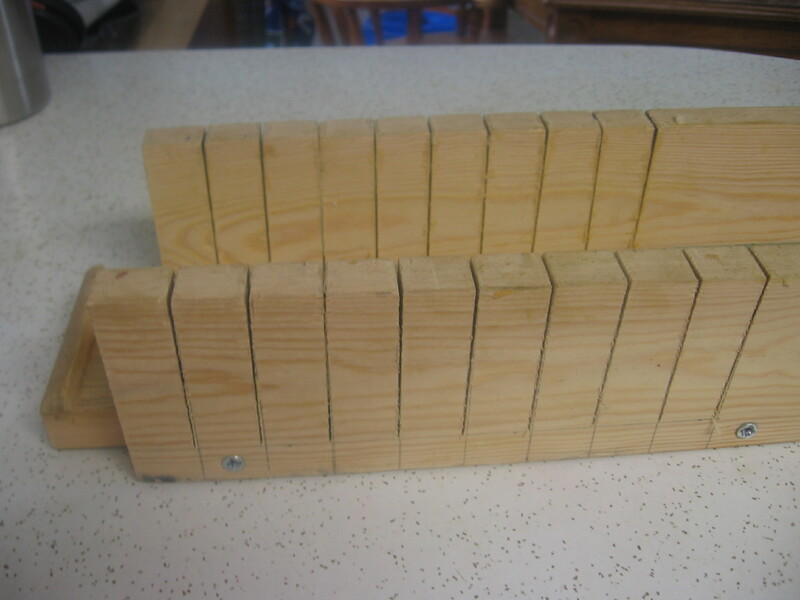 Rather than buy expensive molds and use only recipes that were recommended by them, I learned how to figure my own recipe volumes and make molds that would accommodate them. 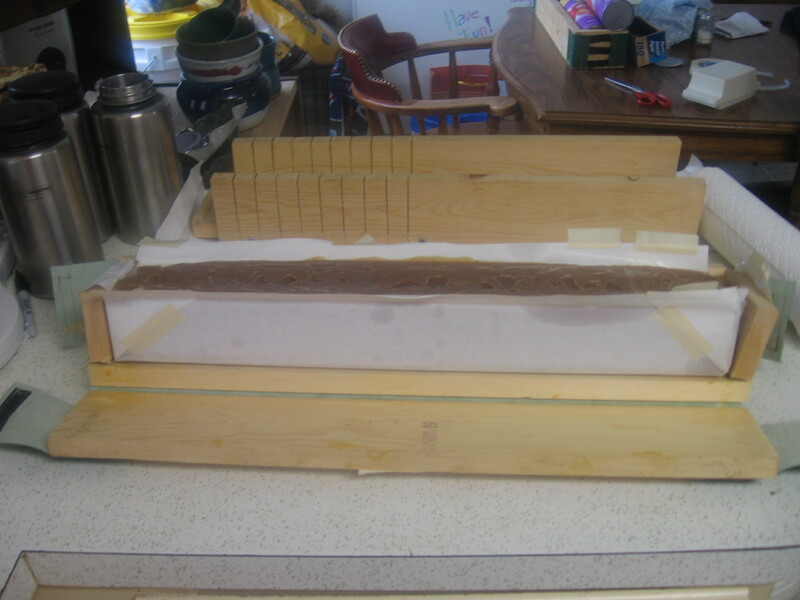 I saved myself some money by using inexpensive materials I had readily available to make my molds. Being more seamstress than carpenter, I designed this one using a pine board, a staple gun, vinyl fabric, and velcro closures. The velcro holds it all together when it needs to be together. 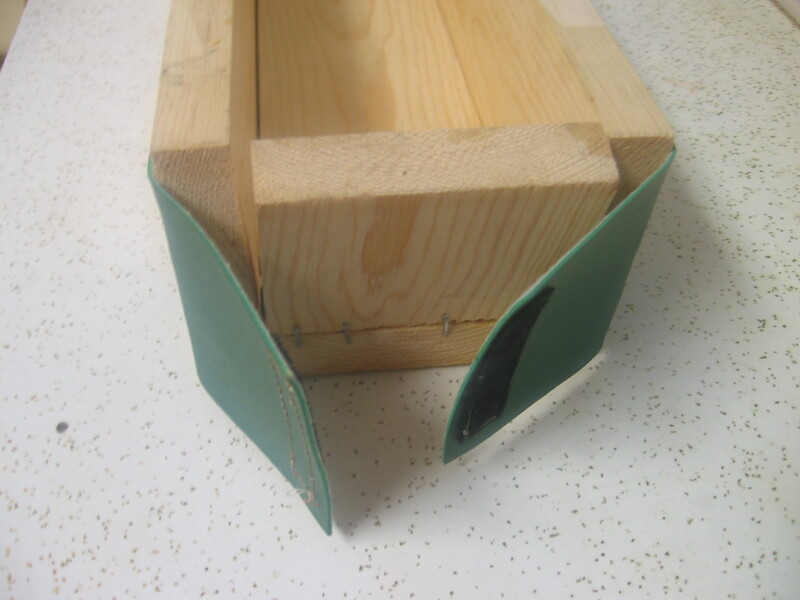 The vinyl makes a very useful “hinge” so the mold will fold away from the loaf when it’s time to unmold. The inside measurements are 3.5 in. by 21 in. by 2.5 inches. 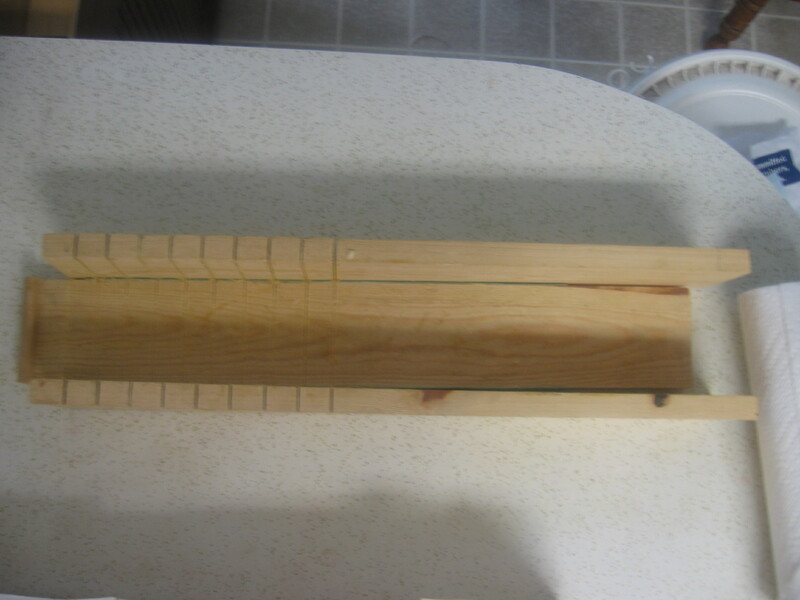 I also created a cutting guide with pine boards of the same size. I secured it with screws, using vinyl fabric as spacers so the loaf would slide in more easily, the base extends 1 inch past the sides and has a stopper. I used a miter saw to cut guides 1 inch apart. 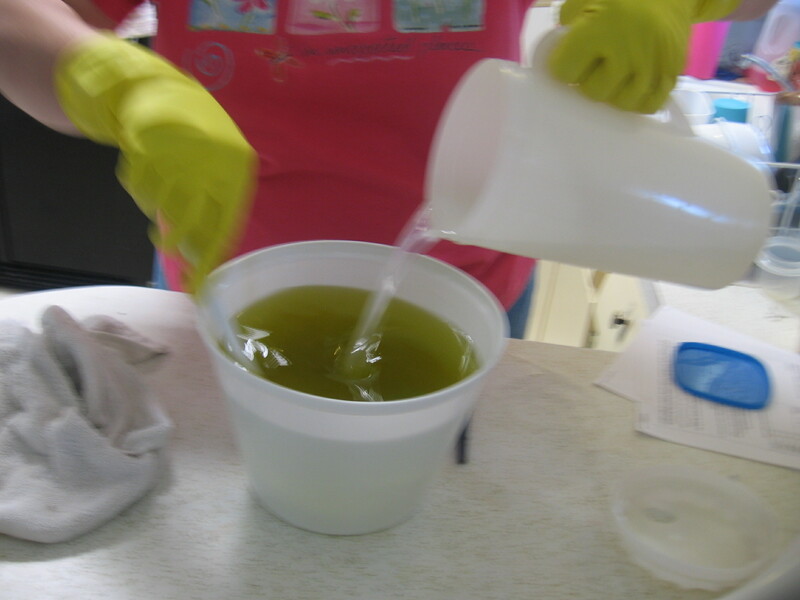 While formulating my recipes, I found tons of information about the properties of the oils used in soap making and the qualities they provide to the soap. There are also tables showing each oil’s saponification value (how much lye is required to turn it into soap) so you can figure it out on your own, but it can be tedious and requires very accurate math. Once I decided on which oils and how much of each to use, this Lye Calculator did the rest of the work for me to determine lye amounts. It’s an amazing tool I refer to all the time! Sunflower Market (or Sprouts Health Food store)–Pomace Olive Oil (for soap you DON’T need to use the extra expensive extra virgin olive oil, trust me!) 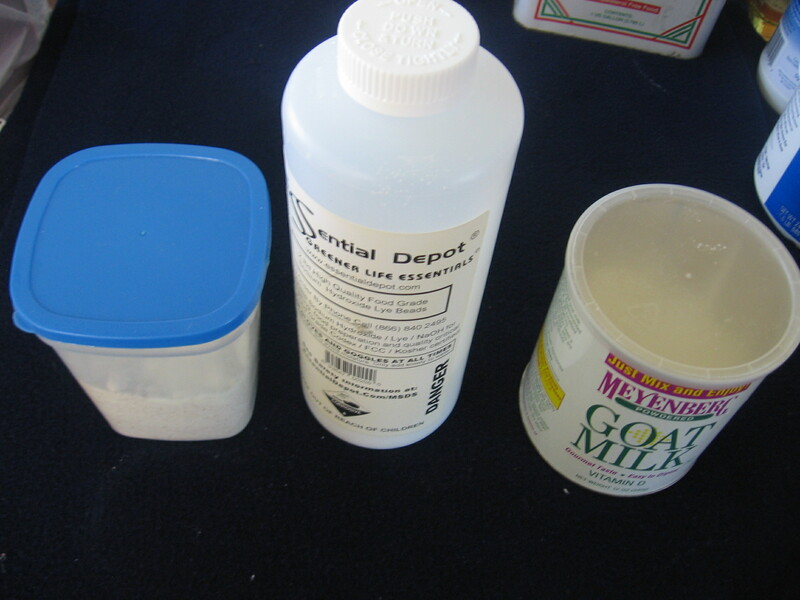 , Palm Oil (shortening), Goat Milk Powder. Walmart: Almond Oil and Coconut Oil (top shelf in the baking aisle) Castor Oil (in the pharmacy) and almonds also in grocery. The best deals I’ve found on lye (sodium hydroxide) are online. Depending on how much you want to buy, and whether you have a local distributor, you’ll have to do your own comparison shopping. For me, these two resources have been excellent: The Lye Guy and Essential Depot. 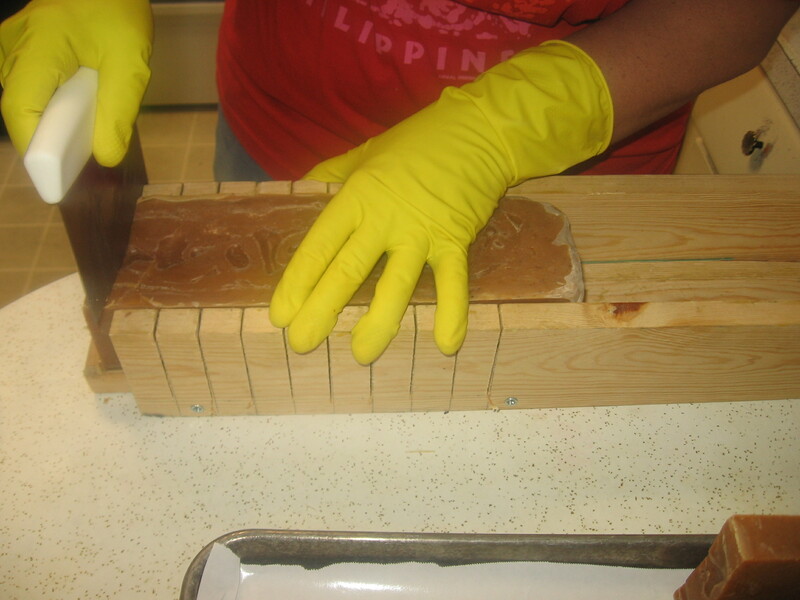 While I’m not an expert on soap making in general, I do feel confident about safe practices with the basics. There is so much more to science than what I know! 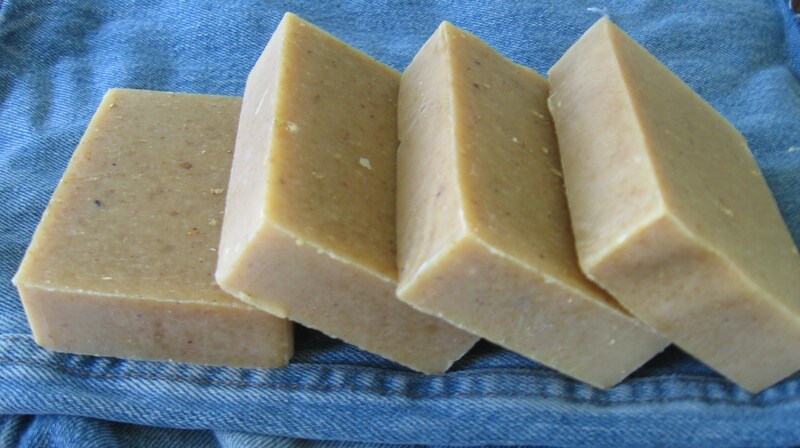 For instance, I have no experience adding scents or colors since my soap is ALL NATURAL. So, if you want to do your own homework I’m including a link to some of my favorite experts HERE. But, if you’re interested in knowing the bottom line, without the entire Soap 101 Course with all the science, I’m just going to give you what you really need to know to jump in. Wear PROTECTIVE GOGGLES and RUBBER GLOVES while handling lye. Some recommend long sleeves, as well. Opening a window is a good idea. Even the fumes can burn your nose. Some experts recommend working in the outdoors. Use a reliable THERMOMETER, and an accurate DIGITAL SCALE (mine measures in ounces and grams. All of my recipes are in ounces.) It is imperative that you MEASURE PRECISELY! *REMEMBER to RESET the SCALE with each measurement to SUBTRACT the WEIGHT of the CONTAINER! 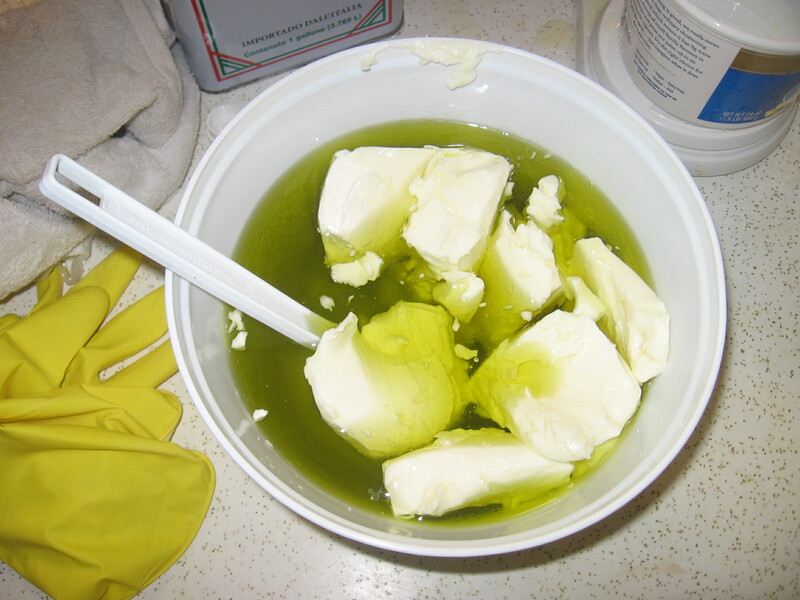 ALWAYS measure, mix, and melt oils together FIRST. This is the most time-consuming part of the process. When the oils are together in a liquid state in the bowl and you have set it aside to cool you are ready to prepare your lye mixture. 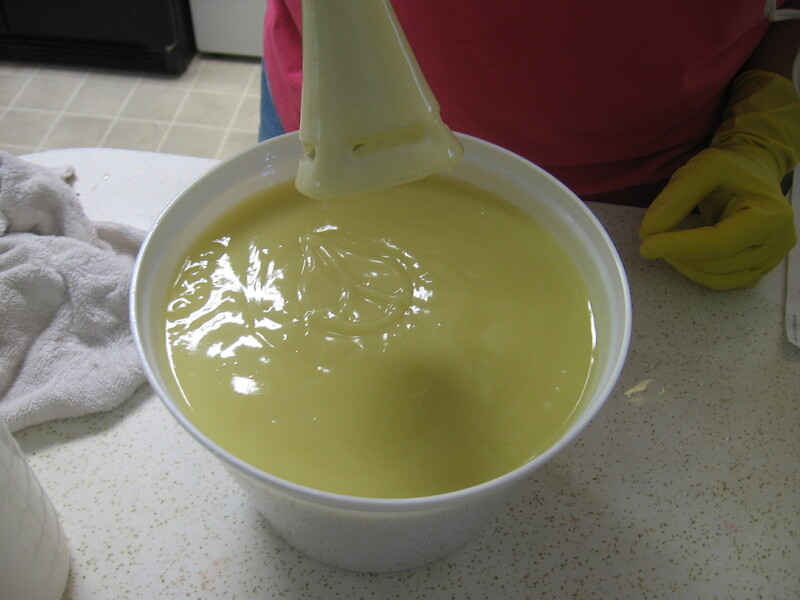 Measure castor oil, coconut oil, olive oil, and palm oil (shortening) into a large plastic mixing bowl or bucket. I use the microwave to heat the oil mixture. Don’t overdo it. It’s quicker to heat it a little more than to wait for it to cool down. 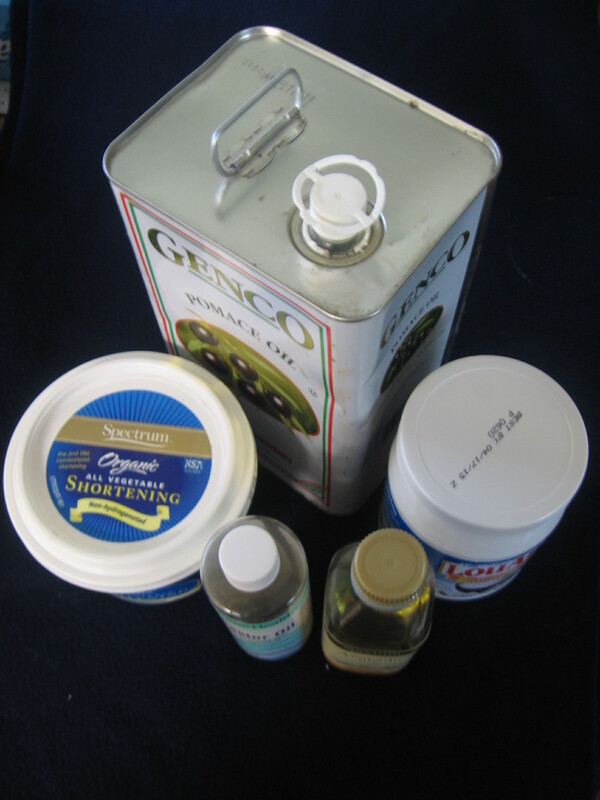 Pre-measure all ingredients to be added at trace and set them and the oils aside while you prepare the lye. Prepare for the lye by putting a couple of inches of water in an old ice cream bucket in the sink. 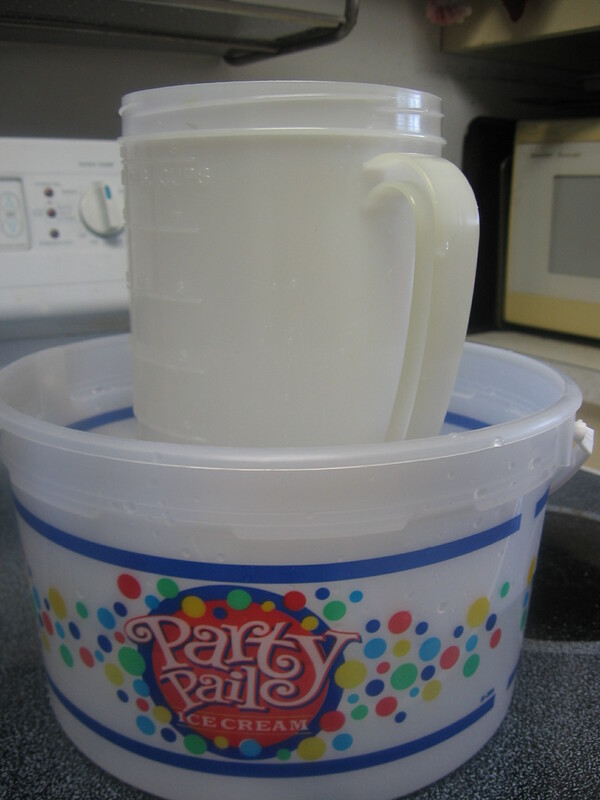 Measure the cold water in your pitcher and set it down inside the bucket, then add ice to the bucket of water. Make sure the pitcher is solid–you don’t want it floating or unstable. PUT YOUR GOGGLES AND GLOVES ON NOW. 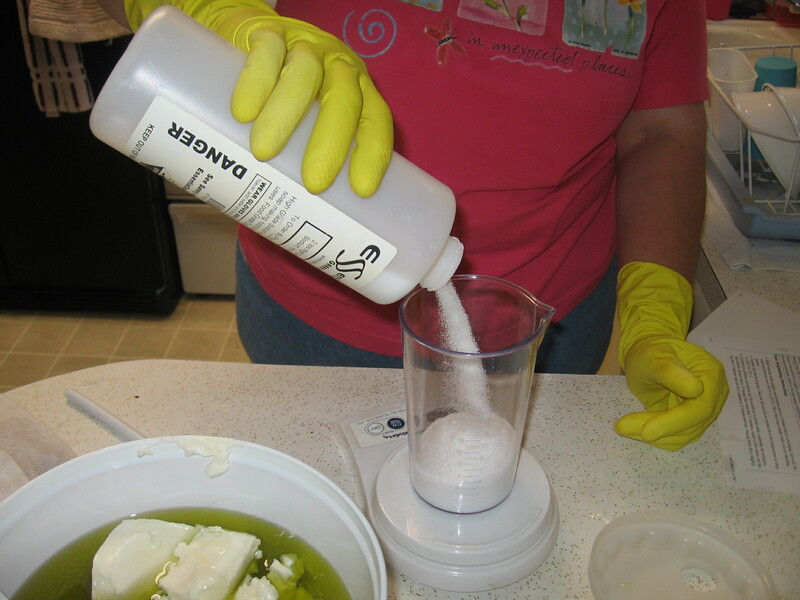 Carefully measure the lye into a DRY container and add it to the water pitcher, stirring gently. You will notice that it heats up very quickly. Stir and check the temperature occasionally as it cools. Keep checking until your oils and lye mixture both reach the same temperature of approximately *100°F. 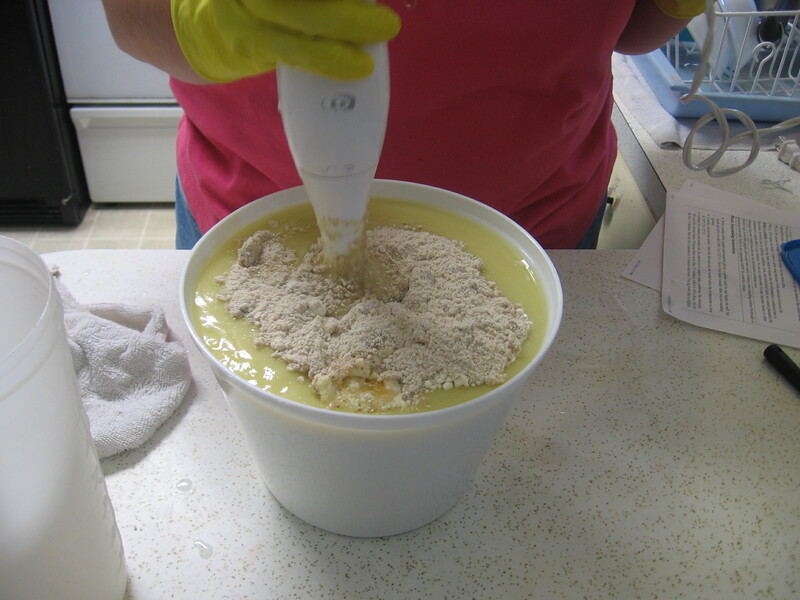 Pour the LYE MIXTURE INTO THE OIL, stir gently, then mix with your stick blender in short bursts until trace. You’ll know it’s trace when it looks like a soft pudding. (Drops don’t disappear, but can be seen on the surface.) In my experience, this can take anywhere from 5 minutes to 25 or 30, depending on temperature, types of oil, and who-knows-what other factors. *Just a note about temperature: I have always followed the recommendation to combine them at 100° F, but I’ve also seen recommendations that include a range of 100° to 125°. I mixed them warmer, this time, simply because they both reached 120° at the same time. (The oil cools at a different rate because it’s not on ice.) The hotter temperature, I noticed, dramatically decreased the amount of time required to reach trace, but also effected the color. The sugars in the goats milk and honey react with the heat to make it a darker color. That in no way effects the quality of the soap, it’s just a curiosity to note. 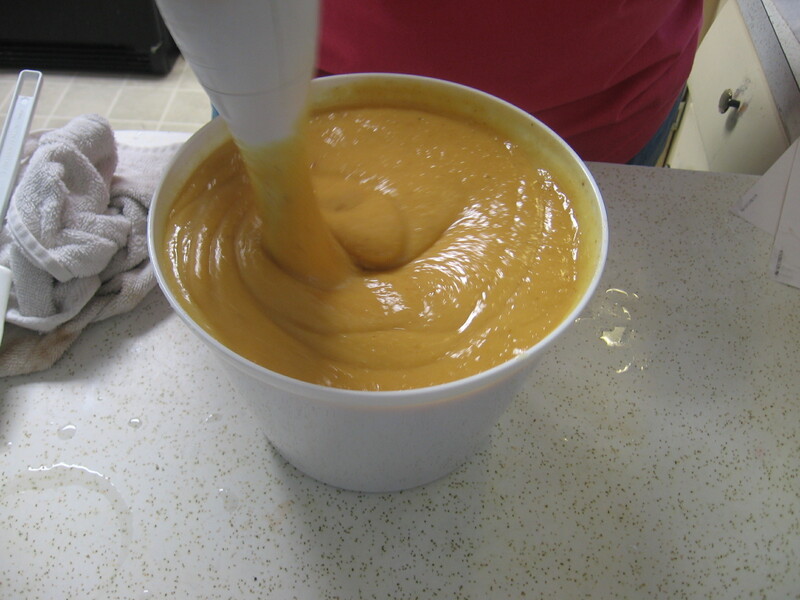 Mix them in well, then you’re ready to pour your soap into molds. 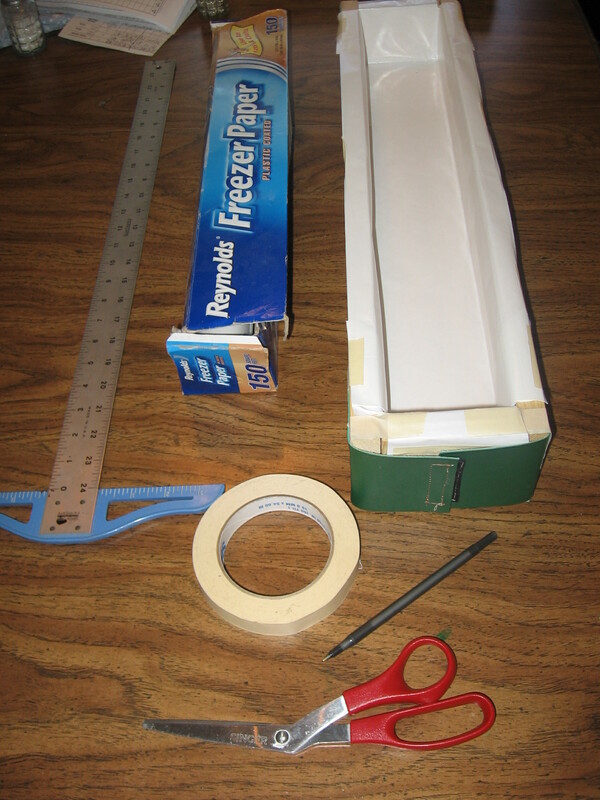 This recipe fits into three regular sized Pringles cans or one wooden loaf mold measuring 21 in. X 3.5 in. X 2.5 in. Soap heats up as a part of the chemical process, but it also needs to maintain even heat, and cool down slowly to come out right. 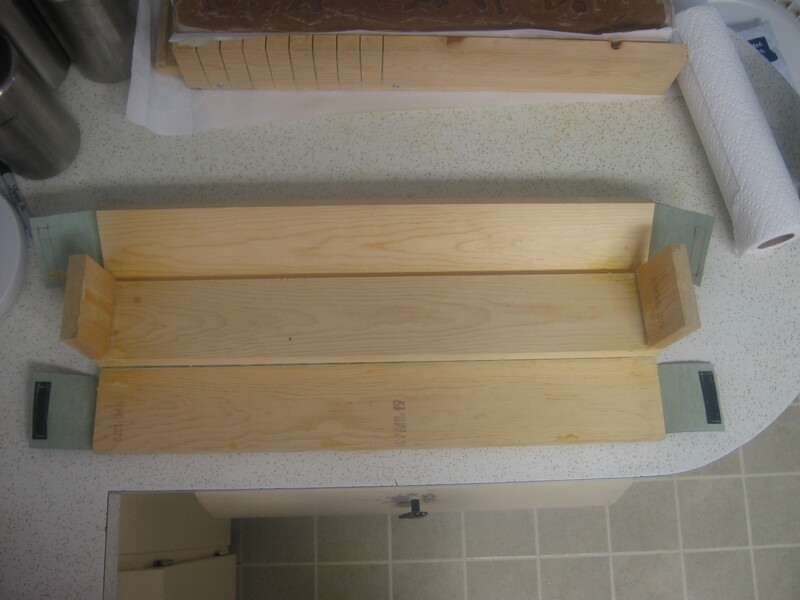 If you use the wooden mold, cover with a strip of freezer paper and another layer of wood insulation (notice I use my cutting guide for this.) If you use Pringles cans, keep them together as much as possible, and wrap them with a kitchen towel or two to insulate for about 24 hours. 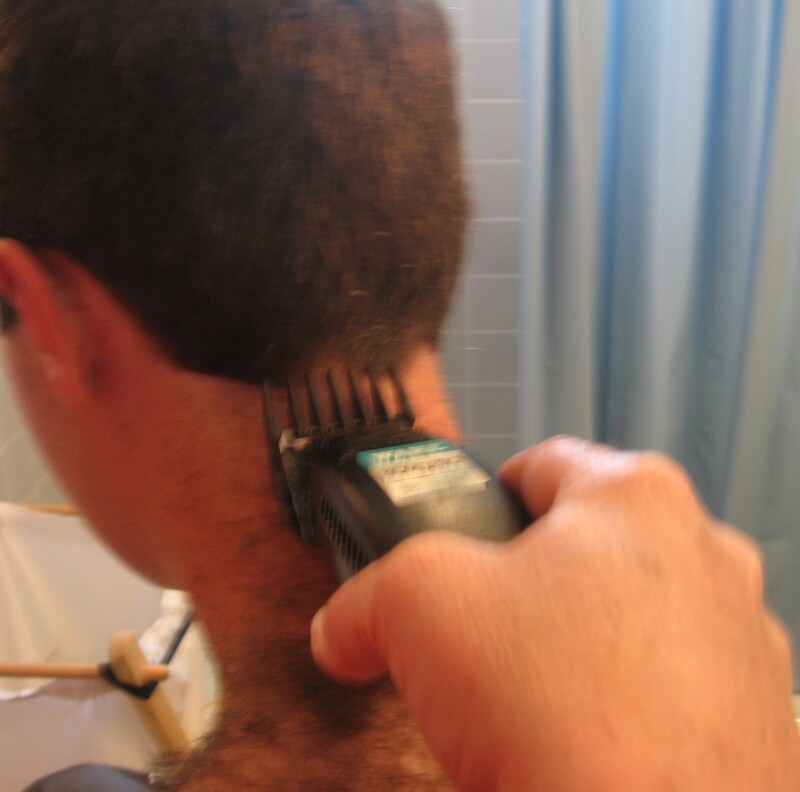 One of my favorite investments that my husband ever made was a $30 set of hair cutting clippers. He thought I was kidding at first, when I told him I wanted it for my birthday. He had only known me a few years at the time, and was just growing accustomed to my practical nature, I guess. I wouldn’t kid about a thing like that. I realize it would not have been the perfect gift for a lot of people. But I had an inkling that I could put it to good use in our growing family. Here are my tools! 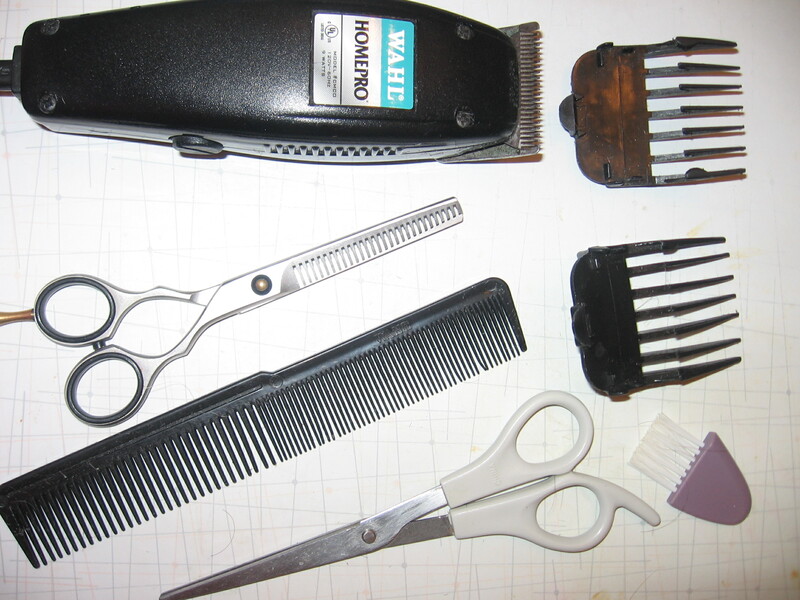 The original set included the clippers and two attachments, as well as a little cleaning brush. I added the comb and scissors. My most recent addition was the thinning shears. 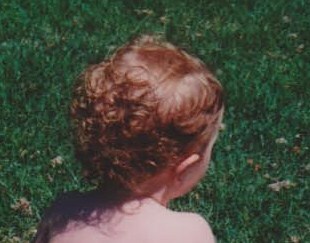 I was not trained as a barber, but I did have a bit of experience with hair. For starters, I’ve always had a lot of it. Thick hair is somewhat “forgiving” of mistakes, and the difference between “too short” and “just right” is only two weeks, anyway, so when I was in high school I trimmed my own bangs. It never occurred to me to go to a salon for a trim. 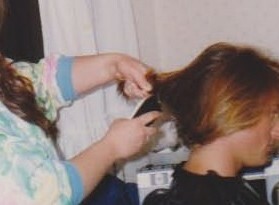 My sister and I took turns snipping each others’ locks when we didn’t want to impose on Mom–she was busy enough. My brothers always had conservative short hairstyles, thanks to her, and I had watched her shear them about every month for all their lives. . . Good enough? Well, maybe not quite. 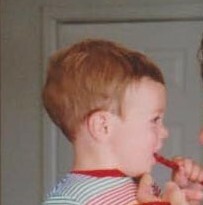 For a few years, after we grew up, one of my brothers trusted me, only me, to cut his hair. It flattered me that he wanted me to be his stylist–he had quite a reputation and an image to keep up. I realized, of course, that it was because he could watch my every move in the mirror and tell me just how to shape it. He knew I’d follow orders better than anyone he could find who had been professionally trained, I suppose. But I will take credit for the fact that it was my close attention to detail that made him ask the second time. I think this was the first time he asked me to cut his hair. You can see it had been awhile since he’d had a trim. Ideally you’d want to gain experience with brand new hair clippers on a willing and very still subject. I had the next best thing–a squirmy 18 month old who didn’t know what he was getting into. I decided that it would be easier to put him in a high chair in front of his favorite movie–Disney’s “Robinhood” if I remember correctly–than to hope he would hold still in a barber’s chair. Practicing on a child has it’s upside, however. He never complained about the outcome, only of it taking too long. In the beginning we went with the buzz–quick and simple. 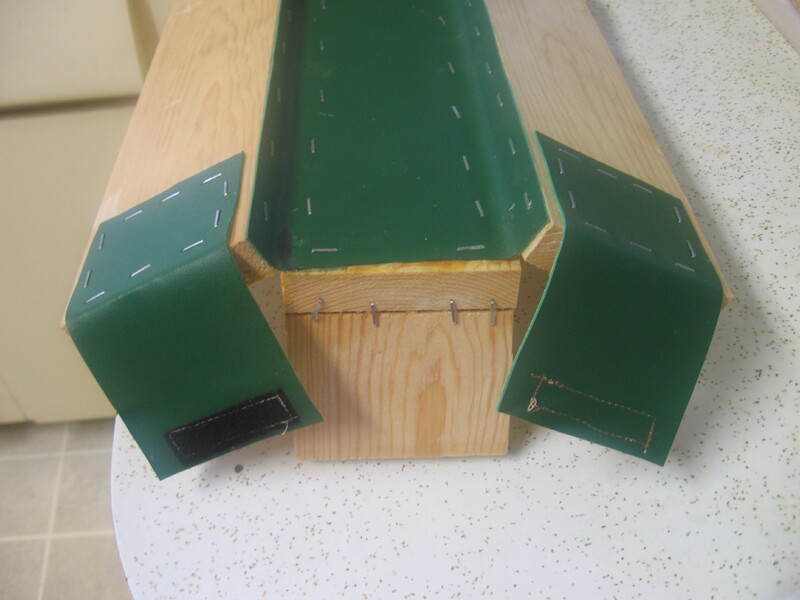 I used the small attachment on the sides and back, the larger attachment on top. 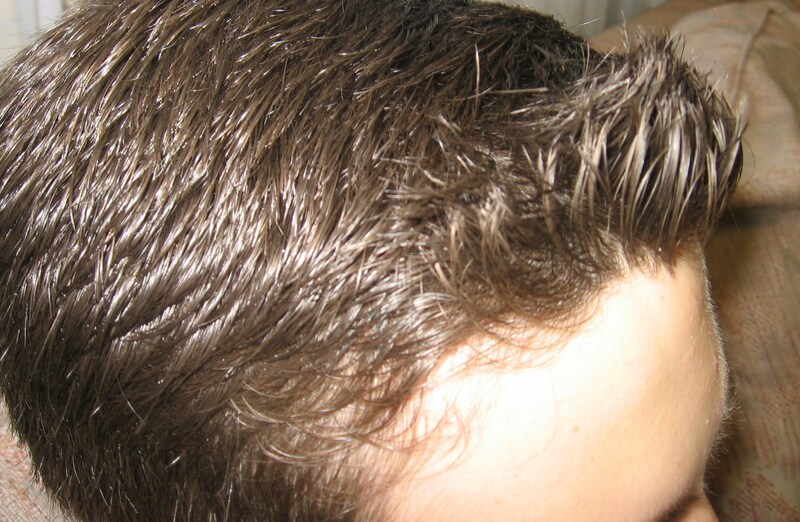 By the time he started making special requests I had figured out how to use scissors and felt more confident about blending and thinning techniques–and he had figured out that haircuts were quicker and the results were guaranteed if he held still. The attachment makes it easy to trim the neckline, back, and sides. 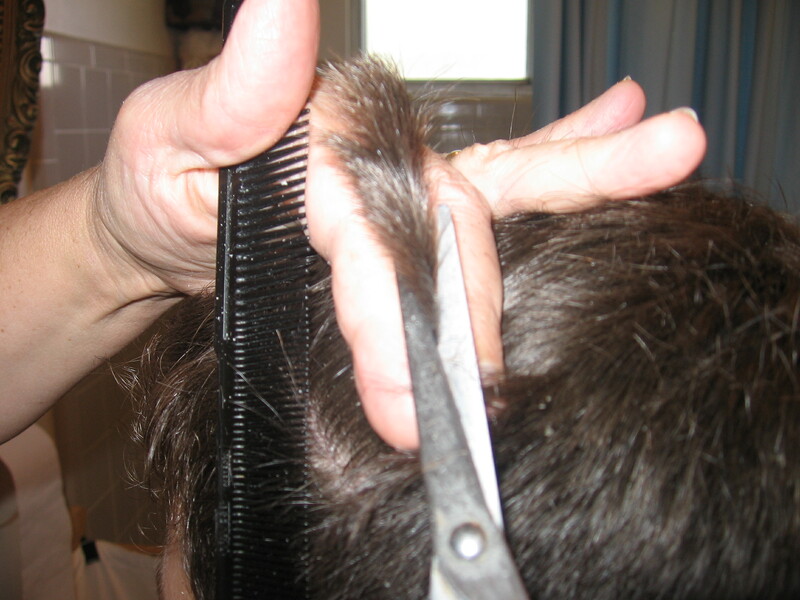 Blending the top and sides is easier after you have learned the pros technique of juggling the comb and scissors. At first it didn’t come naturally, but it didn’t take long before it was quite comfortable. After a few years of grooming my son, and of touching things up when his dad came home from the barber, I finally convinced my husband to trust me. I’ve been the family hairstylist ever since. It’s not my favorite hobby, but there’s satisfaction in knowing I’ve saved the family budget something in the neighborhood of twenty haircuts a year for fifteen years or so. I’ve never calculated it, but that’s worth something! It was frosting on the cake when I overheard my son telling his sister he didn’t want anyone but Mom even touching his hair!